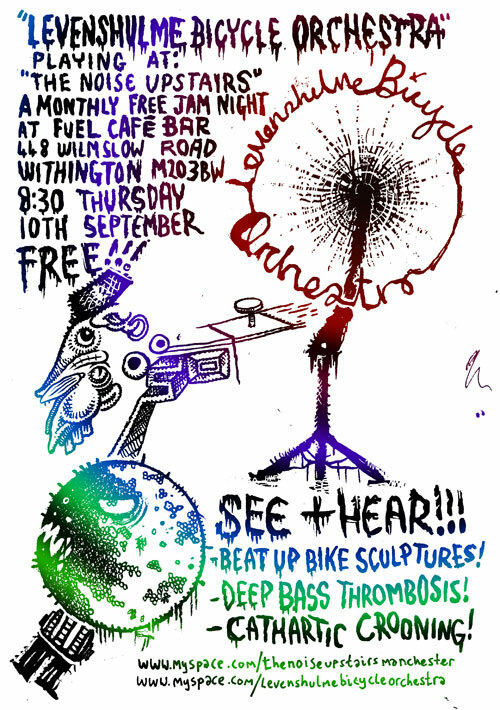 Live Levenshulme Bicycle Orchestra Action! The group operates in an as yet undefined area between intuaitive ritualised musical theatrical performance and shared collective improvising around musical and lyrical themes developed by all members of the group. There are various aims and objectives. To function as an accepted method of therapy for members to express and explore ideas and behaviours in forms that would be unacceptable outside the realms of performance. As a theoretical machinery that allows the musicians and audience to interrogate their own ideas of the boundaries and interrelations between sound, music, tone, vibration, movement, theatre, performance, spectacle, art, and catharsis. As an ongoing process of instrument building, adaptation and reclaimation from that which is not specifically an instrument but with which sound can be made. This use of scrap, discarded and recycled objects rebuilt as instruments locates a utilitarian power with the players and for anyone who wants to imagine and construct their own instruments. See more here and also here.